Last weekend Danielle, Ben and friends made their way up to Hell’s Kitchen. They were on their way to Gotham Market and so they gave me a call. 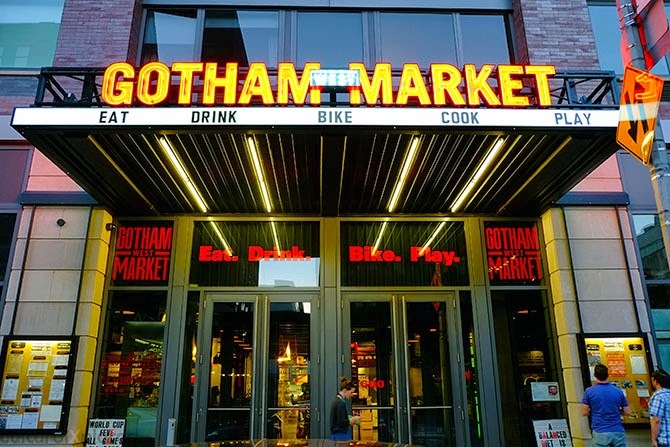 Gotham Market is a gourmet food court that recently opened at 45th and 11th which is right around my apartment. I’ve only heard good things about this place and have been dying to go so I grabbed my purse and was on my way. That’s when I realized what all the hype was about. This place is huge with tall ceilings, tons of food options and even more seating. Besides the variety of food options, the layout is all about freedom. You can grab a glass of wine from the Tapas place and then make your way to get your Ramen bowl while your friend goes for the BBQ. You can sit as long as you like and let your conversation decide when you should leave rather than the waiter handing you the check. This is kind of a perfect place for a date. No wonder these food courts are popping up all over. Ber’gn and City Kitchen are next on my hit list. A big plus to Gotham Market is the new addition of Ample Hills ice cream. This Brooklyn staple should not be this close to me but I’m really glad it is. Gotham Market wasn’t on my bucket list for this year but it should be on yours. After we finished our chicken and waffles (so good!! ), our group decided to take advantage of the area and go bowling at Lucky Strike. Lucky Strike is an adults only bowling alley on 42nd and 12th Ave. They have a large bar with food, ping pong tables, good music and of course a photo booth. The bowling can get a little pricey but they do have happy hour deals and discount nights if you plan ahead. I love bowling and I can be decent at it for the first game before my attention and upper body strength start to dwindle.